So Easy 1st Graders Can Do It! Can 6-year-olds become users of BI software? I took one afternoon to find out. Most of us have seen an episode of the Discovery Channel’s TV hit “MythBusters” where the show hosts try to dispel common myths through scientific experiments. I’ve always enjoyed watching the show and got a kick out of seeing MythBusters’ Adam Savage present at the recent Qlik World Conference event. Last month, my 6-year-old daughter told me her 1st grade class was learning about charts and graphs. I work in the Business Intelligence (BI) software industry and wondered if our claims about “simplicity”, “self-service” and “user adoption” could actually apply to a group of 6-year-olds with very rudimentary skills. 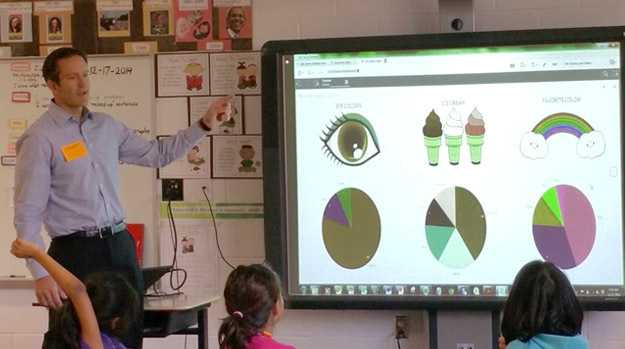 This could be the perfect opportunity to do a little myth busting of my own: so I asked the 1st grade teacher if I could come into class and apply the student’s skills using a free version of the Qlik Sense data visualization software. As expected, the teacher jumped on the opportunity and she recruited two other teachers so the audience soon grew to 67 total students from three classrooms. 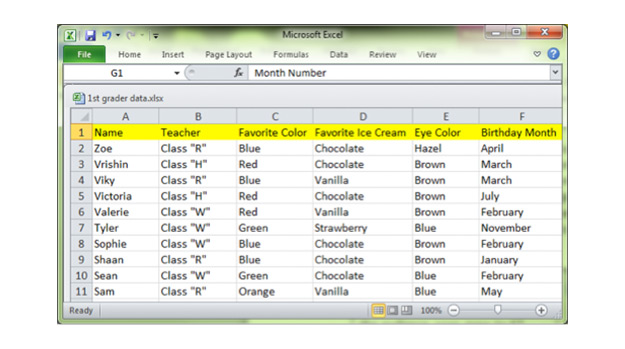 Ahead of my arrival day, we polled each student for their name, teacher, birthday month, eye color, favorite color and favorite ice cream flavor and transformed the survey results into a simple Excel spreadsheet. When the presentation day arrived, I have to admit I was a bit nervous. What would happen if this experiment completely flopped and the kids had no interest or understanding? I shook off the nerves and began by offering colored pencils to anyone who participated or got a correct answer. That got the students engaged right away but no one was able to answer the first trick question after I opened the spreadsheet: “How many students have brown eyes in all 3 classes?” The students quickly learned that analyzing data in Excel was manual and error prone. Can 6-year-olds become users of BI software? @msaliter took one afternoon to find out. I then asked if they wanted to put the data into a bar chart or pie chart and everyone’s hand shot up with a room full of eager volunteers. 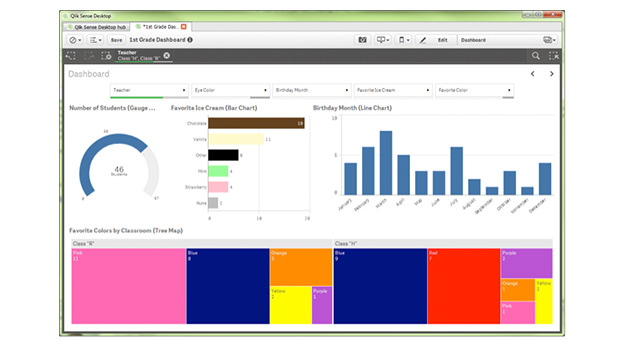 The first step was dragging the spreadsheet from my desktop into the Qlik Sense interface and all of the data was immediately made available. Next, I had the students decide what they wanted to visualize and we quickly constructed some visually appealing charts with just a few simple drag and drops. 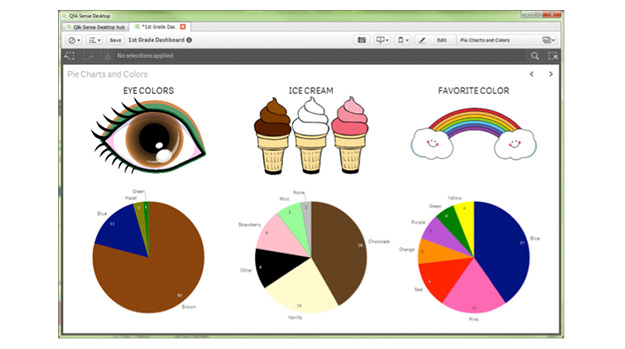 To spice things up, we added in some clip art images and labeled the charts. The ensuing discoveries were loads of fun and in our first pie chart experiment, we learned that 51 of the 67 students have brown eyes and only 5 of the 67 students had mint as their favorite ice cream flavor. Our final experiment involved more advanced techniques such as treemaps and filters. I introduced the concept of a “dashboard” where they could combine multiple interactive charts onto a single sheet. To my amazement, the students followed along and we made some added discoveries such as Classroom “R” having 11 students with Pink as a favorite color but Classroom “H” having only one. 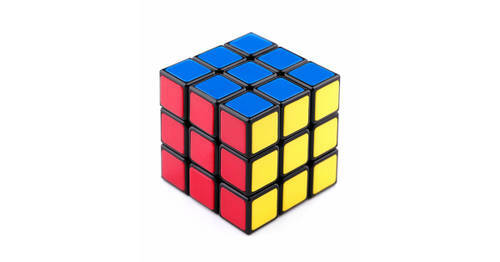 Upon further analysis (and the teacher’s help), we found that Classroom “R” had a higher number of females and all of the Pink selections came from females. After the hour long session, I couldn’t believe how quickly the students grasped the Qlik Sense software and they had lots of fun doing it. My favorite memory was a small girl telling me “I want to do what you do when I grow up” as I was packing up to leave. In the end, this myth buster was proud to confirm that 1st graders CAN be users of BI software if it’s presented in a way that is meaningful to them. 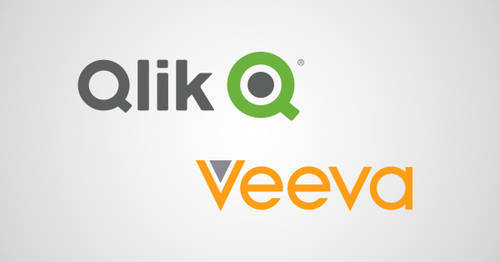 If you are interested in seeing some live examples of Qlik Sense demonstration apps, you can interact with them on this public demo site.